So… I re-watched Airplane! for the umpteenth time a couple of nights ago. Yeah, I’ve seen this movie many times… so many times. You know what, though? I am not tired of this movie at all. The 1980’s brought a lot of terrible things to our society: neon fashions, big hair and country rock. One good thing was Airplane! 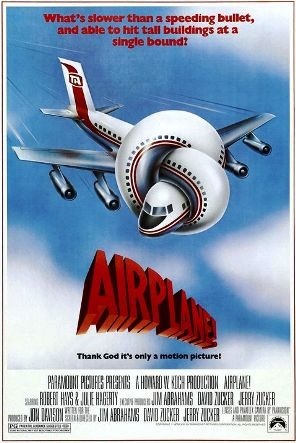 Starring Robert Hays as ex fighter pilot, Ted Striker suffering from post traumatic stress who now has a terrible fear of flying, who attempts to conquer his fear and hops on a flight that his ex-fiancé is a air hostess, Elaine Dickinson, played by Julie Hagerty aboard the flight that he desperately wants to reconcile with. During the fight,many of the passengers, and the entire flight crew succumb to food poisoning leaving the plane crewless. Despite his post traumatic stress, Striker is forced to take the reigns and get the plane safely down. While this is happening, he is fighting internal Demons, and a air traffic controller that does not believe in him, pressure from all around him and some genuine silliness. The scenes in the control tower are some of the funniest (in my opinion), ever captured on film. Filled with cheezy lines, puns and just genuinely great, funny and bizarre from a surprisingly good cast. This is the movie, that for many, is considered the vehicle that launched Leslie Nielsen as a comedy powerhouse (Yeah, I know Police Squad came first). This movie makes me laugh and smile every time I see it. Very loosely based on the 1957 movie Zero Hour! and taking bits from the Airport movies, Airplane! does a great job of parodying the disaster movies of the late 1970’s. There are two sequels to this movie, which are funny but not as good as the original. If you like this then I say go ahead and watch them, just don’t expect them to be as good – they are not. Go watch this movie if you haven’t – if you have, go watch it again! This entry was posted on June 18, 2013 by catfishman. It was filed under 1970's, 1980's, 70's, Airport, Awesome, Canadian, comedy, confusion, crazy, drive in, dumb, entertaining, entertainment, family, film, fun, funny, good, great, movies, music, original, parody, reviews, silly, Society, stupid, trailers and was tagged with 1970s, 1980s, 70's, Airport, awesome, Canadian, comedy, confusion, crazy, drive in, dumb, entertaining, entertainment, family, film, fun, funny, good, great, movies, music, original, parody, reviews, silly, Society, stupid, trailers.